I am a waffle ho’. I have to admit. Last year I got a second waffle iron for the city — we had one upstate but we are only there on weekends. And I’ve been experiment with old and recipes. I find this recipe to quite different from Bisquick. I grew up on Bisquick and it’s the “authentic” flavor we first imagine, just like Kraft caramels and French’s Yellow Mustard. But, moving on in life, you discover new and better things. I posted this four years ago. I make it monthly. My Bisquick waffles seemed to demand strawberries. Because of the crunch of cornmeal, blackberries seem best here. How much of your childhood do you remember? It can be frightening to search for memories and sense how much seems to be lost and yet there are points of reassurance when some memories seem to be permanently, and perhaps prominently, positioned in your brain. My childhood Sunday breakfasts were always one of two things: pancakes or waffles. With bacon. Now, in the 1950s whether you were making pancakes or waffles, you reached for that same yellow box with blue lettering. There is nothing wrong with Bisquick. It’s a solid product and produces a good waffle. If you want a great waffle, though, it’s time to bake from scratch. In her 1993 book Waffles, Dorie Greenspan sings the praises of these cornmeal waffles. She calls the cornmeal contribution magic, offering sweetness and crispiness and crunch. She was absolutely right. The sweetness may also come from the maple syrup and there is a little underlying tang from two cups of buttermilk. This is now my go-to waffle. It’s better than Bisquick. What to put on top? I have to have syrup on my pancakes and you may, too, on your waffles. 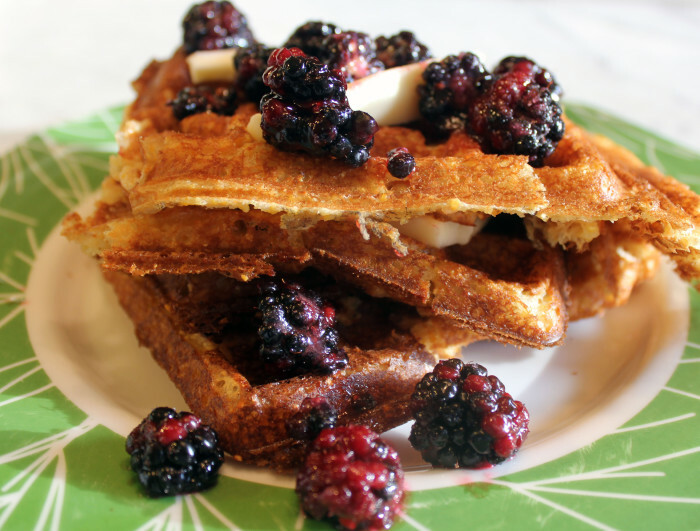 But I happen to love the purity of just berries and butter atop the waffles. With fresh blackberries or strawberries, I cut a cold pint box of them in half, sprinkle with sugar, and allow to stand in the kitchen while I make the waffles. The berries and their sugared juice are all I need. Along with the melting butter. And the bacon. Thinking of what to have for breakfast on Christmas Day or New Year’s? This is a very enthusiastic start to the day. Preheat your waffle iron. If you want to hold the finished waffles until serving time, preheat your oven to 200°F. Melt the butter; reserve. In a large bowl, whisk together the flour, cornmeal, baking powder, baking soda, and salt. In another bowl, thoroughly combine the buttermilk, maple syrup, and eggs. Pour the liquid ingredients over the dry ingredients and whisk, stopping when the ingredients are just combined. Stir in the melted butter. Lightly butter or spray the grids of your iron, if needed. Brush or spray the grids again only if subsequent waffles stick. Spoon out Vs cup of batter (or the amount recommended by your waffler’s manufacturer) onto the hot iron. Use a metal spatula or wooden spoon to smooth the batter almost to the edge of the grids. Close the lid and bake until browned and crisp. Serve the waffles immediately or keep them, in a single layer, on a rack in the preheated oven while you make the rest of the batch.